It is important to talk to your GP or maternity hospital staff if you feel you need support to quit smoking and drinking during pregnancy, especially if other drugs such as cannabis, cocaine, heroin or methadone are involved. If you drink or do drugs, so does your baby. Any drugs you use enter your bloodstream and pass to your baby through the placenta. The effects of drugs on your baby depend on the baby’s stage of development and how much of the drug you use. While the effects of different drugs may vary, your baby is extremely vulnerable to toxins found in all drugs. Below is information on known effects of drug use on the baby. 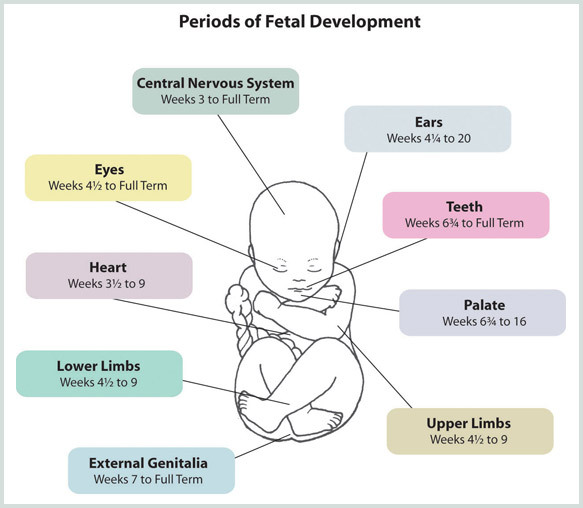 Figure 2: Periods of Fetal Development. Courtesy of FAS, USA. As you can see from Figure 2, your baby is developing all the time. There is no safe time during pregnancy to use drugs. The biggest risk is to your baby’s central nervous system (brain and spinal cord) and their growth. There is no safe level of alcohol in pregnancy so it’s best to stop completely. We know alcohol is harmful to your growing baby as it causes damage to their central nervous system. It also causes birth defects. Drinking any amount can increase your risk of miscarriage. Regular drinking can affect the size of your baby, so they are born much smaller than normal. You may not see the effects when your baby is just born. As they grow up, children who were exposed to alcohol in pregnancy often show poor attention and hyperactivity. If you are a regular heavy drinker, your baby is at risk of developing a serious condition called fetal alcohol syndrome. This affects your baby’s growth and they may be born with a small head – a sign of poor brain growth, facial defects, and mental and behavioural problems. Smoking is bad for anyone’s health. If you smoke cigarettes while you are pregnant, all the toxic chemicals that pass into you are also passed on to your baby. The most common risk is that your baby will be born smaller and weaker than normal, so they are more likely to be ill. Smoking can damage the placenta, causing it to rupture or detach. This increases your risk of miscarriage and premature labour. The chemicals you inhale, such as carbon monoxide, can reduce your baby’s oxygen supply. Nicotine causes blood vessels to tighten and can decrease the amount of blood, oxygen and nutrients that reach your baby. Nicotine also suppresses your appetite so you may not eat enough for you and the baby. All of these can affect your baby’s growth and development. It’s best to stop smoking completely when you are pregnant, for the sake of your own health and your baby’s. It is never too late to stop smoking during pregnancy – stopping at any stage reduces the risks for your baby. If you smoke cannabis with tobacco, the effect on your baby will be the same as above. It’s hard to know what effects are caused by cannabis alone as it is usually mixed with tobacco or used with alcohol. Cannabis crosses the placenta the same as all other drugs, so it is a risk to your baby’s health. It may increase stress in newborns and make children more impulsive so some effects may only emerge later in life. If you use stimulant drugs such as cocaine and amphetamine (speed) your baby may be born smaller and in distress. Use of cocaine can lead to very serious complications with your pregnancy and may cause your baby to have a stroke. They may also go through withdrawal after birth. Cocaine has also been linked to heart defects in the baby and may lead to learning difficulties as they grow up. Opiates like heroin, methadone and morphine cross the placenta to the baby with great ease. Your baby can become addicted and go through withdrawal after the birth. You also risk pregnancy complications, premature birth and birth defects. If you inject heroin, you risk getting HIV if you are sharing needles. If you contract HIV there is a high risk you will pass the virus on to your baby – ask your doctor for advice on how to prevent this. The impact of taking drugs during pregnancy can result in poor eating habits, lack of exercise and other health related problems – these may also affect your baby’s development. Prescription and over the counter medicines can also carry a risk to your baby. All drugs pass to your baby through the placenta. Before a medical drug is sold, research takes place to determine if is safe to take during pregnancy. When buying over-the-counter medicines your pharmacist should be able to advise you about this. If you are prescribed any medicines, your doctor will tell you about any risks. If you are on medication before you become pregnant you should speak to your doctor about whether you should continue taking it. Some prescription drugs can be abused, such as benzodiazepines. You may use these as sleeping tablets or tranquillisers (e.g. valium). These can cause problems for your baby. Visit our Services Directory and find help and support near you. If your pregnancy is unplanned, there are are a number of free crisis pregnancy counselling services that can provide you with non-judgemental support and information. Visit www.positiveoptions.ie for information on these services including contact details. llicit Drug Use and Adverse Birth Outcomes: Is It Drugs of Context?